How often are we recognized for all the hard work we do? Or for the critical contributions we make to projects? We're all often moving at such a fast pace, that we forget to stop, take a look around and offer recognition for a job well done. There's a great deal of research that shows a lack of acknowledgment has a direct impact on productivity. We at The Center want to harness the power of recognition and acknowledge those in our industry who utilize evidence-based design in projects. To that end, we are launching "The Evidence-Based Design Touchstone Awards". These awards – a natural next step in the EBD progression – recognize the use of the evidence-based design process in the pursuit of increasing value and improving outcomes and engagements for stakeholders. Awards are given to projects that show exemplary achievement across touchstones of the EBD process: collaboration, evaluation, and sharing. We are opening up submissions for these awards on August 4, 2017. Click here to learn more about these awards. November 11-14, Healthcare Design Expo & Conference, at the Gaylord Palms Resort & Convention Center in Kissimmee, Florida. Webinar "A Culture of of Inquiry Drives the 50-Year Odyssey of an Iconic Father Daughter Team"
Interview: "The Role of Design in Fostering Effective Communication, an interview with Beverley H. Johnson"
Member Project: "Pacific Pediatrics Clinic Design Adds Fun to Inspire Lifelong Wellbeing"
Case Study: "Design Solutions to Improve Healthcare Access and Outcomes - Kaiser Permanente Antelope Valley Medical Offices"
In some ways, designing and building healthcare facilities is almost as challenging as keeping the systems running efficiently and effectively, according to the speakers at a recent Seattle Healthcare event. Making projects pencil and providing the best possible design once they do are certainly no easy tasks in a time when uncertainty is the new norm in the healthcare industry. In Seattle, California, and other markets, construction costs are climbing — mostly because of the cost of labor. Subcontractors can be selective about the projects they undertake. That is a complete turnaround from seven or eight years ago. It is good that Seattle is a booming market, but that puts even more pressure on developers to contain construction costs. For developers and designers of healthcare facilities, that is especially true, since healthcare space is so specialized and its construction is more labor-intensive than other property types. BISNOW, more. . .
Each year, the nation’s health system spends billions of dollars trying to treat, manage and prevent an array of avoidable conditions that only continue to grow in prevalence. Nearly two-thirds of all deaths annually are attributable to chronic conditions. Patients with chronic conditions account for 81% of all hospital admissions, 91% of all prescriptions filled and 76% of all physician visits. Roughly 86% of the $2.9 trillion spent on healthcare in 2013 was related to chronic disease. Modern Healthcare, more . 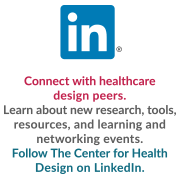 . .
* What impact do design decisions have on behavioral health outcomes? Join today's top experts on September 26, 2017 in Arlington, VA, at our next Pebble in Practice Workshop - "Behavioral Health—Strategic Facility Design Innovations that Improve Treatment Outcomes, Safety and the Bottom Line" More information here. Despite their small physical size, microhospitals are fast becoming a big thing in health care design. Historically, hospital construction has been based on the premise of “build it and they will come,” says David Argueta, FACHE, president, CHI St. Luke’s Health — The Woodlands, Lakeside and Springwoods Village hospitals. Inpatient beds have defined a hospital or health system, in large part. “When we talk about health care systems and hospitals, part of the statistic is how many beds we have,” Argueta says. Today, priorities are shifting toward “driving the cost of health care down and building ambulatory access points that are focused on who we serve — really focused on the patient experience and their journey through health care. Finding a way to do that in a lower cost environment — that’s what everyone’s trying to do,” he says. Healthcare Design, more . . .
to an upcoming EBD Journal Club: "Does Space Matter? An Exploratory Study for a Child–Adolescent Mental Health Inpatient Unit"
The University of Minnesota Masonic Children’s Hospital Child–Adolescent Mental Health Inpatient Unit embarked on a renovation project to relocate the hospital’s child and adolescent mental health units. Evidence-based strategies were employed for the design of the new unit to enhance the experience for patients, staff, and families and to support changes in operational and procedural strategies. This EBD Journal Club will explore design elements and spaces as a contributing influence to behavior and well-being for patients, staff, and families in a child–adolescent mental health unit. Want to Provide Your EBD Expertise? Scott Christensen, a doctoral student at the University of Phoenix is in need of volunteers, with at least three years experience with healthcare construction in the US, to participate in three rounds of questionnaires related to the implementation of EBD in healthcare construction. Want more information? Write to Scott at healthcareebd@gmail.com. This webinar explores the idea that as people live longer, managing the needs of the aging population is more important than ever. How can we design our environment to support health, wellness, and happiness both now, and in the future?